Most of our stock molding profiles and many of our custom profiles are available in Flex - email for a quote if not priced below. We have 1000's of patterns. A few more are listed here. Stock No Grain: 36", 72"; Stock Oak Grain: 36", 60", 90"
9/16" x 2-1/2" Flexible casing for Half Rounds. Flexible Cove 11/16"w x 11/16"h x 10'. No Grain or in Oak Grain. 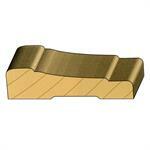 May be used in curved jamb, baseboard or chair rail applications. 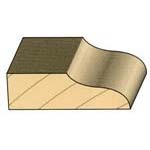 Flexible boards may be used in curved jamb, baseboard or chair rail applications. For casing applications please call for a quote. Flexible Head 9/16"w x 1-3/16"h x 10'. Stocked in No Grain. Flexible 7/16"w x 11/16"h x 10'. Sold per Piece. 1. 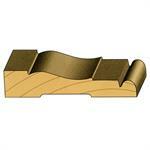 Base – Typically installed with the back of the moulding to the wall so a standard straight piece can be used. The moulding will need to be pre-bent if it is a very tight radius application or if used on the ceiling as part of a crown assembly. 2. Chair Rail – Same comment as "Base." 3. 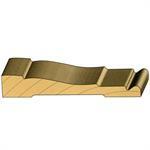 Crown – Most crown moulding must be pre-bent but this depends on both the size of the crown itself and its application. See "Ordering Crown" section below for more information. 4. 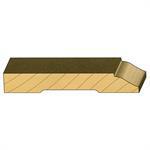 Jamb – A straight piece can normally be used. 5. Small Profiles (Corner, Shoe, Cove, Base Cap, Quarter Round, etc) – These items are generally very flexible and only require pre-bending when used on a tight radius application. 6. Panel Mould - A straight piece can be used along a curved wall but the moulding may need to be pre-bent for other applications. Contact our customer service department for clarification. 7. S4S (Flat Stock) – Depends on size of the piece and the application. 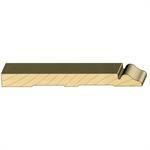 When used as a base, jamb, or jamb extension a straight piece will work. If used as casing, the part must be pre-bent. Contact our customer service department for clarification. 8. Brick Mould – Depends on how the moulding is being used (if casing, generally needs to be pre-bent). 9. 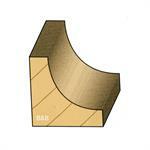 Casing - Depends on the thickness and width of the profile (see below) and the radius of the curve. See "Ordering Casing" section below for more information. › You can generally compare the flexibility of a piece of polyurethane moulding to a piece of rubber – the thicker and wider the piece is, the harder it is to bend and vice versa. › For a small piece of moulding (like a shoe mould), the piece will bend very easily and a straight piece will work for most applications. › For a larger piece of moulding (like a base or casing), the moulding will bend easily in the direction of the thinner dimension (like base on a curved wall) but will be more difficult to bend in the direction of the wider dimension (like casing over an arched doorway). › Straight pieces can generally only be used for larger true radius arches but the ability to use a straight piece is determined by how large the radius is versus the width of the profile. For example, for a 2 ¼" casing, a straight piece will work if the radius is greater than 72." › Half rounds, ovals, and ellipticals will generally always need to be pre-bent unless it is a very small profile. Please see below information under "Ordering Casing" for more detail. **In the case of any uncertainty, you can always fax our office a tracing of the profile in order for us to ensure that our moulding matches exactly. Application – We need to know how the moulding is being used (half round, arch, elliptical, curved wall, etc). Dimensions – See below for details on how to measure the proper dimensions for each type of application. 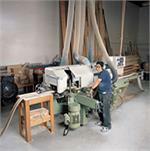 Length of Material – Our standard mold length is 12’. Shorter lengths can be custom made but it may be less expensive to order "stock profiles/items" in the standard 12’ length. 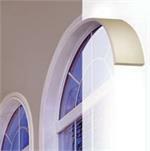 Casing is generally used around windows, doors, and cased openings. However, it can also be used on the ceiling as an accent for crown moulding, as rake mould, as panel mould, etc. Please specify if you are using a casing profile in a non-standard application so that we can ensure to supply the correct item. Casing is generally bent with the thick edge to the outside of the radius, but sometimes customers choose to install it "backwards" (thick edge to the inside). You will find this frequently with casing as panel molds, rakes and on the ceiling. Please specify clearly if the moulding needs to be reversed. 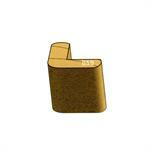 The sizes for half rounds are based on the DIAMETER (2x the radius) of the inside jamb width. For example, a "2/0" half round will have a diameter of approximately 24". For a true half circle (half round) part, the radius (or rise) will be half of the diameter. IT IS A TRUE RADIUS OPENING. Casing for elliptical and oval applications must be pre-bent at our factory. NOTE: There are limitations regarding how tight a radius can be created (a general "rule of thumb" is approximately 3x the width of the profile) so please contact our sales department if you have a tight radius application. Whether it is a Convex (Outside Radius or "OSR") or Concave (Inside Radius or "ISR") application – see below pictures. IMPORTANT: Please specify clearly if the crown is being used for a dormer application or a Tudor style (ski slope) roof. How is the crown being installed? Identify the top (the part against the ceiling) and the bottom (the part against the wall) of the profile. The radius of the wall and/or ceiling – please use the below diagrams if you are not sure how to calculate the radius. 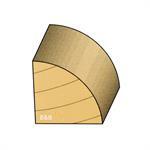 -If it is a true radius application, the radius can be determined by providing the WIDTH and RISE (similar to an arc). Please provide the “A,” “B,” and “C” dimensions (as shown here) and we can calculate the radius. *A template may be required if there are multiple radii. Other important point – If you are using crown backer (ceiling plate and/or wall plate), please provide a drawing identifying what goes where. 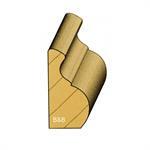 Base and chair rail profiles are typically installed with the back of the moulding to the wall so a standard straight piece is normally used unless it is a very tight radius (might need to be pre-bent). Please specify length of material required (12’ is our standard length), the profile name, and the species of wood that is being matched. Please clearly specify how the product is being installed (as casing, as jamb, as base, etc.) so that we can determine whether to pre-bend the moulding or not. 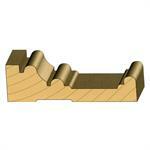 We stock most standard dimensions (1x4, 1x6, etc. in 8’ and 12’ lengths) but custom sizes are available with no set up charge. We also have molds for "1x product" with "wood grain" (similar to a Cedar texture) that can be used for interior or exterior applications. Please specify the width, thickness, length of material required, and whether wood grain is required.